Stay tuned below for a really amazing free resource for you that will help you get dressed easier each day. I wore this to a softball tournament for my daughter, where the temp throughout the day varied by 25 degrees. I wanted to just be COMFORTABLE, so I went with my go-to Madewell high rise jeans and my rose gold Birk’s. My oversized sweatshirt (and an additonal blanket!) came in handy as the night wore on and got chilly. P.S. They came in second place in the tournament, I’m so proud! If you’ve been following me for a hot minute, you know that this dress has been a favorite of mine for a couple of years now! It is lightweight, so easy to wear on hot summer days, and I always get complimented when I wear it. Last year UO brought it back in a different variation (and this one is pretty close), but now Abercrombie has an almost identical version. Okay, so I think wearing this combo of light gray, denim, and camel colored shoes is my fave right now! Ever since this Addy poncho came in the mail I have been obsessed. It is made out of a light, worn in sweatshirt material, and drapes just right. I like wearing it with ripped denim and denim cuttoffs. It can be worn on or off the shoulder, OR as a shrug (WHAAAAT…) And you may notice that I wear this Julia coin pendant necklace almost daily. It works on its own, or layered. Oh! You can find my Free People dupe slip ons HERE! Oh, and I spy the Botanical Chandelier earrings..
On Friday my husband had a day off from work, so we headed out for a day date! We had the best time eating a delicious lunch, and just chatting and making plans for Spring Break and our upcoming 15th anniversary (we are coming to you, Hawaii!) I’m wearing those jeans again, and dragged an old pair of studded gladiator sandals out of storage. I forgot how much I loved them! These are a really similar pair from the same brand. This Lularoe kimono is one I reach for time and time again when I want to jazz an outfit up. This Free People tie dye one is a fave of mine, and Target has this floral version! Okay, so we have discussed my obsession with these boyfriend jeans from American Eagle. The distressing and color are perfect for Spring/Summer, and they look great with a simple tank and shoes. Add in some fun jewelry and you are out the door! This tank, you guys, it is the UNICORN of tanks. It fits not too tight, not too loose, you can wear a regular bra with it, and it is under $20. I bought it in four colors: white, gray, black, and mauve, and it is THE tank you will see me in all summer. I am wearing a size small and it is generously sized. 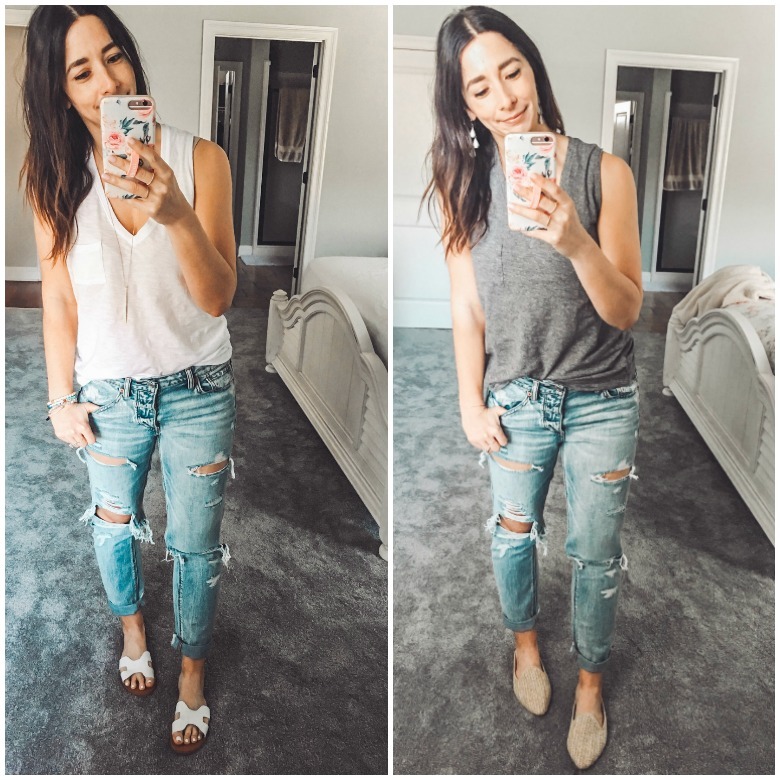 Every Spring/Summer I look for a simple, versatile tank that is inexpensive, and that I can mix and match with everything. This is that tank. P.S. Have you grabbed my Uniform Guide below? 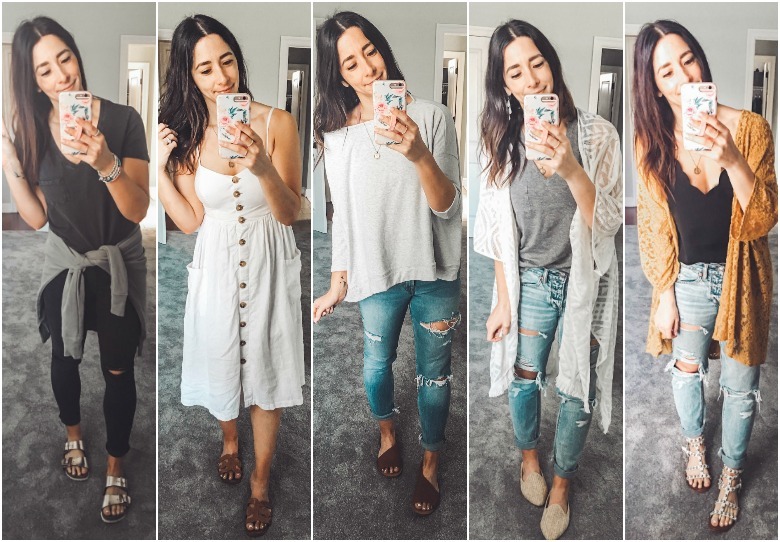 It is how I come up with what I will wear in each of my seasonal capsules, and it a total gamechanger when it comes to gettting dressed each day!